Olive trees require a well-drained soil and a sunny position. Avoid sites where water stands during rainy periods or where ground water seeps into a hole. Do not, however, confuse the olive for a desert plant. It needs regular watering to thrive. Insufficient water will cause your tree to suffer, and even die if left too dry for too long. Select a site that receives at least six hours of direct sun per day. Full sun is ideal. The climate in Cyprus is ideal. If your plant your tree pot plant at the depth it has been growing in the pot . Do not change the soil with organic material, moisture-retaining polymers, fertilizer or anything else. Simply plant in the native soil (provided it is well-drained) and backfill with the same. If your tree a stake, it should already have a stake in the pot. A very young tree may require a heavier stake as it grows. Once the trunk thickness reaches 5 cm or more in diameter (or perhaps less for shrub-form or short trees), it will no longer require a stake. Until then, use a stake large, enough to hold the trunk upright. Put the new stake in the same hole the previous stake occupied and tie the tree to the stake with arborists’ tape. Do not use wires, water hoses, cloth, cables, guying systems or other means of securing your tree. A good stout stake and the proper tape is all you need. Olive trees do not need special olive tree fertilizer but results will be exponentially more satisfactory with a good nutrition regimen. If planting is done after mid-August but before March 1, do not fertilize at the time of planting; wait until spring. Otherwise, fertilize after planting and regularly throughout the growing season. How regularly will depend upon the type of fertilizer used. Use a premium slow-release fertilizer with essential minor elements (zinc, boron, calcium, etc.). Use a fertilizer that has a nitrogen analysis of at least ten percent. A fast-release farm-type fertilizer such as 10-10-10 or 13-13-13 may be used according to label directions. Many such fertilizers contain some minor elements and are widely available. Be sure to water very well after application. These fertilizers are generally not for use on plants in pots. Liquid fertilizers may be used (again, a formulation with minor elements is best) but it should be remembered that liquid feeding is a fleeting thing and must be repeated often. Organically-derived fertilizers are available and a good thing, though often more expensive and rarely contain the percentage of nitrogen preferred by olive trees. Top dressing with organic material such as composted manure or kitchen compost can be done. It can be difficult to achieve a good balance of nutritional elements by this method. It is environmentally responsible but requires more study and understanding by the gardener. Always avoid placing compost or any fertilizer next to the trunk of the tree. Whatever type of fertilizer is used, it is best to feed lightly and often during the growing season. Avoid heavy applications of fast release fertilizer that could damage plants and leach or run-off into groundwater. Always read and follow label instructions. Do not fertilize after mid-August or before mid- March unless you live in a very warm climate. If your tree is planted in a lawn area, take care that lawn maintenance practices do not harm the tree. Do not allow “Weed and Feed” products to be used within 30 feet of your tree. These products are designed to feed lawn grasses and destroy other plants. Remember that the roots of any tree extend far beyond the drip-line of the branches. Also, do not allow weed-eater operators near your tree. Weed-eater operators kill thousands of trees every year by “girding,” or removing the bark from the bases of trees. Wood chips are bad, okay? Do not use wood chips, cypress mulch, etc. for mulch. These products are high in carbon and rob the soil of nitrogen and other nutrients in the decomposition process. They also hold too much water in wet periods and, once dry, shed irrigation water and rainfall like a shingle roof. We prefer to use only pine straw for mulch and keep it back several inches from the trunk; do not allow a build-up of decomposed mulch around the base of the tree trunk. If pine straw is not available, you can mulch with pine bark or gravel. Once established, olive trees are among the most drought-resistant trees in the world, but porous soils such as sand are very inefficient at retaining moisture; olive trees in sandy soils must be watered often. You will have to water sufficiently to get your tree established and thereafter as necessary during dry periods. No one can give you a formula for that; you will have to observe and evaluate. Low volume spray irrigation can be used effectively, but drip irrigation is of little or no use in sandy soils. Olive trees do not require pruning in order to produce fruit, at least not until they are around 50 years old. It is okay to prune olive trees to achieve a desired shape but remember that they fruit on branches that grew during the previous spring and summer; cutting off a lot of such growth will preclude or greatly reduce fruiting potential for the next season. It may be helpful to prune the top, upwardly growing, branches back by a few inches to encourage lateral growth, thus facilitating the picking of fruit. It is also a good idea to cut out small interior branches that will ultimately clutter the tree’s appearance and provide protection for any pests or diseases that may be lurking around your site. If fruiting is not important, you can shape your olive tree to any way you please. The only pests we have known to attack olive trees outside of olive producing regions is an armored scale insect. It is not common but should be watched for, especially if your site has other species prone to harbor scale insects. Inspect the trees by looking under the leaves and in the branch axils for a dark bump the size of a “BB.” These insects do not move in the adult stage; they attach themselves like barnacles. The presence of sooty mold on leaves and bark, or ants crawling on your tree, indicates the presence of scale insects. If scale is found, it may be treated with a variety of products, depending upon personal preference. It may also be removed by hand if you have only one or a few trees. If you have other plantings that attract pests such as thrips or stink bugs, these may also have a go at your growing olive trees. Consult your local garden center or pest control specialist about the control of pests. Regulations vary from place to place. Did you know you can grow olive trees in the landscape? Growing olive trees is relatively simple given the proper location and olive tree care is not too demanding either. Let’s find out more about how to grow olive trees. Growing Olive Trees Think of olive trees and one visualizes the warm sunny Mediterranean, but olive trees can be grown in North America as well. Most aptly suited to areas which are prone to high heat and plenty of sunshine, the olive tree should be planted outside and once established is fairly low maintenance. Olive trees have lovely silver leaves, which will compliment many other plantings of the garden but are also grown for their fruit. 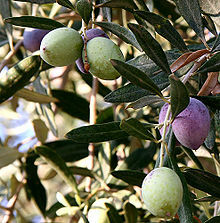 The olive tree’s fruit can be pressed for oil or cured (brined) and eaten. How to Grow Olive Trees Most olive trees take about three years to come into maturity and begin to set noticeable amounts of fruit. To increase fruit set, it is recommended that you plant more than one cultivar close together. Olive trees like to be planted in well drained soil in a sunny area of the landscape. The olive tree is an evergreen that flourishes in hot dry areas, and as such, will not do well in wet winter soil. . Unless you are growing olive trees for a strictly ornamental purpose, it is most advisable to plant a specimen with a single trunk for ease of harvest. Look for olive tree specimens that are actively growing with soft new growth sprouting from the shoot tips. In an olive tree orchard, the trees are spaced 20 feet apart to accommodate their eventual size; however, there is no strict rule of thumb on spacing. Spacing will vary according to the cultivar. Dig a hole the size of the olive tree’s container. Leave the root ball alone except to remove or cut any circling roots. Do not add soil medium, compost or fertilizer to the newly planted growing olive trees as stated above. Also, avoid adding gravel or drainage tubing. It is best for the young olive tree to acclimate to its soil. Olive Tree Care Once your new olive tree is planted, it is a good idea to provide drip irrigation as the tree will need water every day, especially during the summer months throughout its first year. Once you begin to see a quantity of new growth, feed the growing olive trees with nitrogen rich compost, conventional fertilizer or concentrated organic. Minimally prune during the first four years, only enough to maintain shape. The young olive tree may need to be staked right up against the trunk to assist with stability. Commercial olive tree growers harvest fruit in September or October for canning purposes and small fruit is left until January or February and then pressed for oil.